Less than a week before Gov. Matt Bevin gives his formal state budget proposal, Republican Senate President Robert Stivers, Bevin’s ally, gave an ominous prediction. “I think this budget that will be introduced and proposed by the executive branch will be one of the most austere budgets that I’ve seen in my 20 years in the General Assembly,” Stivers said Wednesday on the Senate floor. Bevin, a Republican, suggested just as much when he was campaigning, saying that the state would have to undergo “belt-tightening across the board” during a debate on KET. At issue are mounting obligations in the state pension systems and Medicaid program. The Kentucky Teacher Retirement Systems has requested about $1 billion in additional contributions from the state to meet its obligations to retirees. Meanwhile, the state will have to start paying an increased share of a Medicaid program that was expanded and now covers an additional 400,000 Kentuckians. That’s expected to cost $250 million in 2017. Democratic House Speaker Greg Stumbo took a slightly more optimistic position, saying that the state is predicted to rake in more revenue over the next two years. “There are new dollars flowing into the state’s coffers,” Stumbo said. Bevin’s predecessor, Democratic Gov. Steve Beshear, predicted 2.9 percent growth in fiscal year 2017 and 2.4 percent growth in 2018, plus about a $242.3 million surplus at the end of the current fiscal year. But on Wednesday, Stivers said it wouldn’t be enough. He said Bevin’s budget could mean cuts to state programs, freezing pay raises and a halt on new building projects. “There are going to be tough, tough decisions made because the bill has come due,” Stivers said. 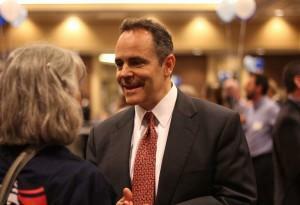 Bevin’s State of the Commonwealth Budget Address will be at 7 p.m. Tuesday.